Easter in Spain is a large celebration full of tradition, processions and of course food! 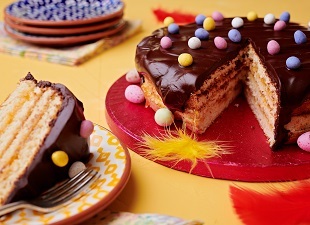 There are lots of different recipes and dishes that are associated with Easter in Spain and we've developed some for you so that you can try some new recipes this Easter that taste and look fantastic and most importantly they are gluten free! Le Mana De Pascua (Spanish Easter Cake) - This is a traditional Easter cake given to children by their god parents. It makes 8-10 portions but it didn’t last long as everyone had seconds! Tastes a bit like a jaffa cake, with the apricot jam and chocolate, go all out on the decorations and it will be a great gift. Croquestas de Bacalao (Salt Cod Croquettes) - Croquettes are a great starter or snack. We have used salted cod but you can also make them with ham, chicken, cheese, prawns, or salmon. Potage De Vigilla - This soup is traditionally served on Good Friday and other fast days, hence the name "soup of the vigil". Hornazo (Spanish Meat Pie) - This is a traditional bread, more like a meat pie with a bread crust as opposed to the traditional pastry crust. is made and eaten traditionally on the Monday after Easter in Spain. The best part about this bread is that it is a complete meal by itself. You can change or alter the filling to suit. We have stuffed it with bacon, chorizo, and hard-boiled eggs. It can be served as it as a snack, grab and go options or eat it for breakfast. I also tried it with roasted peppers, onion and cheese and that was a hit. Torrijas (Sweet Bread) - This sweet bread is a Spanish sweet Easter treat. Similar to French toast, torrijas have many variations – some soften the bread by soaking it in wine, while other variations use milk or water and honey. Slow Roast Lamb with Fennel and Anchovies - This is a great centre piece for Easter Sunday lunch. Serve with green seasonal vegetables and roast potatoes, coasted lightly in paprika. Use the shoulder cut if you are opting for a budget friendly meal centre piece as its cheaper, but feel free to use leg if you wish. Choose a joint to suit the number of guests and your budget. Log in to see recipes and share your creations with us!